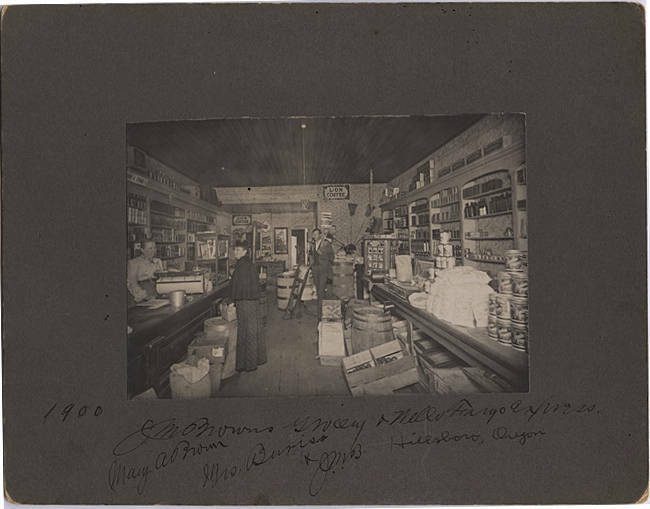 A black and white photograph of a long narrow grocery store, with three people visible. One lady in a medium-toned skirt and lighter shirt tucked in with a belt stands behind a counter with a roll of butcher paper in a framework. Before the counter stands a woman in a long, dark, patterned skirt, a short dark cape and a flat dark hat. In the background of the image, a man in a suit with a darker vest over a white shirt and tie stands beside a dolly. Various crates, bags, and wooden barrels line the open floor space, with fruit or vegetables visible in at least one crate. Brooms are arranged against one back wall, and canned goods and bottles line the shelves and share counter space with neatly piled bags of goods. Small glass display cases rest on one counter, and another display case is visible to the right of the man. A sign stating 'Lion Coffee' is posted on the back wall, and another illegible sign is posted above a wooden desk that stands behind a wood stove.